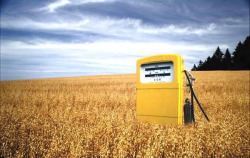 Under the Renewable Fuel Standard, the United States uses biofuels to meet about 10% of its gasoline needs, utilizing fuels produced under requirements for net reductions in greenhouse gas emissions. Background: U.S. energy policies have related but distinct objectives, seeking to enhance domestic fuel production, reduce reliance on imports, and improve the environment through reducing both the absolute level of fossil fuel use (thus lowering greenhouse gas emissions), and fuel-related pollution such as ground-level ozone and smog. Biofuels, notably ethanol and biodiesel, have been viewed by Congress as meeting these objectives, and have also been promoted as a source of jobs and farm-based prosperity in rural America. Debates over important aspects of biofuels, such as the size of future mandates for their use, continue. Program Operation: The Renewable Fuel Standard (RFS), first adopted in 2005 and significantly expanded in 2007, establishes annually-increasing volume requirements for the use of renewable biofuels in the U.S. fuel supply, up to an eventual total in 2022 of 36 billion gallons. There are separate mandates for specified quantities of total biofuels (which includes conventional corn-based ethanol), advanced biofuels (a category that includes biodiesel and sugarcane-based ethanol among others) and cellulosic fuels – which have so far seen extremely limited commercialization. These mandates are “nested” in such a way that a higher-priority fuel can be used to meet requirements for a lower-priority fuel, e.g., biodiesel qualifies as an advanced biofuel but may also be used to meet the total biofuel requirement that would otherwise be met through corn ethanol. The RFS assigns fuels to the various categories on the basis of their life-cycle greenhouse gas reductions compared to conventional gasoline, and the Environmental Protection Agency (EPA) conducts a rigorous analysis of each fuel “pathway” that is proposed to qualify for the RFS. The RFS is a mandate on fuel refiners and importers, who are assigned an individual percentage share of the national RFS each year. These “obligated parties” show compliance with the mandate through Renewable Identification Numbers (RINs), which are generated through the production of biofuels but may also be purchased in a secondary market. Biofuel producers must retain third-party engineers to verify that their production practices meet RFS guidelines. Biofuels – still mostly corn ethanol – are now near 10% of the U.S. gasoline supply, a level referred to as the “blend wall” because a 10% ethanol mixture has generally been the maximum level consistent with most automobile warranties. If the RFS mandate for corn ethanol (13.8 billion gallons in 2013) exceeds 10% of the gasoline supply, the blend wall has been reached. The wall could then only be overcome through the use of blends above 10%. The Environmental Protection Agency (EPA) has approved up to a 15% blend in later-model automobiles, but few service stations have offered the product so far. Auto-makers also manufacture flex-fuel vehicles which can use up to 85% ethanol, but the fueling infrastructure has not developed in most places. RFS mandates for 2014 have not yet been finalized, but the EPA proposed for the first time to reduce the mandates below the levels provided in statute, in recognition of the blend wall and other factors. This proposed reduction has been controversial. The blend wall creates public-policy challenges, but reflects some environmental good news: U.S. gasoline usage is billions of gallons below the levels that were projected when the RFS was amended in 2007. Although some of the lower use reflects the financial crisis, it also shows the impact of more fuel-efficient vehicles in the wake of high energy prices. The RFS is the primary federal policy tool encouraging biofuel use (previous federal tax credits and import charges for ethanol have expired, although a federal biodiesel tax credit may be extended). The U.S. Department of Agriculture, and some states, also administer programs aimed at encouraging biofuel production in various ways. Administration and Enforcement: The RFS is under the jurisdiction of the Environmental Protection Agency (EPA.